Yeah I guess you're right. It was more entitlement than anything. But it seems that crowd was the vocal minority. Do Germany and Spain get games late, do they have weird tastes in games or do they just have different buying habits (or all of the above)? Those charts are for March. Germany hasn't been updated yet. As for Spain, I think we are still waiting for April's numbers. While it’s difficult to tell with targeted ad’s, Detroit is almost up there with God of War in terms of the online marketing push. I can’t really speak for the TV presence as I watch very little. Likewise, although Amazon is not the best for judging specific software sales, it’s decent for a snapshot of how a titles fairing. Detroit has been in and around the top 5 for some time now. Yes it's entitlement to complain about a port coming out years after the original release and being charged more than the original price. I swear, sometimes this message board figuratively blows my mind. Impressive! every post you make makes me roll my eyes harder. I think microtransactions are a good business decision, but it doesn't mean I have to like them. I think DKTF pricing is a good business decision but I don't have to like it either. It doesn't make me entitled, I'm not demanding anything from Nintendo. I guess being against corporate ballwashing does make me a vocal minority. Oh well. Definitely not on par with God of War, not even close. For God of War you have special bundles, E3 major game reveal, Gameinformer cover page, ads un cinemas... This is Last of Us or Uncharted type of marketing for God of War. Detroit is not there. Okay, let's not act as if 13k or some sales are some great rebuttal to a late port being full price. And you think it would have fold multiples of that if it were cheaper? Highly unlikely. Sorry to tell you Nintendo made the right call on the pricing. Just wait til it goes on sale. The game has been out for years on WiiU and is like 20 bucks there. If you waited this long you can wait for a sale. I'ma just wait it out. It is what it is. Thanks guys! I knew I must be missing something. Opening was actually around 96K according to Bruno. So if we expect another ~50% drop next week (ending 13th May), then GOW will be around 13-14K. and on week ending 20th may it will be below 10k. Labo yikes. God of War doing very well. Super deserved. Labo is actually getting what it deserves. i think it's reasonable and okay for GoW to cede the number one spot to FIFA.....especially in UK. I’m specifically talking about online marketing. Ad’s on YouTube, site ad’s etc., but it’s difficult to judge based on what’s targeted vs everyone seeing them. Detroit is certainly being treated as a AAA release by Sony, bigger than say the recent Shadow of the Colossus release. The FIFA 18 World Cup update marketing should be kicking in soon for the May 29 release - as others have said, expect FIFA 18 to claw back first place before then. Out of MK8D, BotW, SMO, Splatoon 2 and 1-2 Switch, only BotW dropped more than 1 place WoW, and even then it was only by 2. They have achieved a good barometer and level of consistency here it seems- no sign of them slowing down either as they been in the chart at those sorts of positions for weeks now. Weird that FIFA 18 isn’t charting on Xbox but so high on the PS4. I know you can get it bundled there? but there’s seems quite a big difference. Shame NNKII didn’t make a re entry as it seemed to get a good price drop. LABO has short legs. Looks like for now it hasn't caught the attention of users or new consumers. Yeah, ever since Xbox lost marketing it has been doing low on it. Sorry I did not pay attention to the “online” aspect. I agree this is considered as an important AAA, kind of Infamous Second Son level. Detroit definetly doesn't get GoW marketing treatment as it has simply no ability to sell 10m lifetime even if it revolutionized the story genre. It is a mid budget (around $30m production costs) new IP in a still nieche genre. Considering that Sony does a decent job for what is appropriate. I've seen quite a few online ads now, they are pushing the game with new material constantly and the demo release. It had a presence at every trade show since it was the major reveal at PGW and got a lengthy E3 press conference trailer slot every time. Then they had a big preview event across the whole world and Sony is giving away an artbook with a lot of physical pre-orders right now as well as throwing in a lot of goodies for the digital edition. So for a mid range title it is marketed quite well and will sell well if the reviews are good. It hinges entirely on that and decent word of mouth. Solid reviews usually always lead to that for story based games though so the scores really are the last hurdle. At worst it probably does 1-2m lifetime like Beyond. At best I see it beating Heavy Rain so like 5 million. People waiting on EA Access to add it, FIFA 17 was added April last year, so either it’s World Cup or PS4 marketing holding it back this year. Great seing Sea of Thieves showing some legs. I think it would've sold much better at a $40 price point though, yes. Did Nintendo make the right call? Probably yes, they are profit based. Did DK:TF sell well and justify the $60 price tag? In what world is a 13k opening selling well? Yea, it did better than the abysmal opening of the Wii U version. That's not exactly a high bar to cross and doesn't propel it into the "selling well" territory. Looks like SoT being the major Xbox bundle is it’s saving grace in the charts. Otherwise I think it would have probably disappeared by now (and deservedly imo). How’s the player count and Twitch streams doing? Or has it already be mostly forgotten about? Article says the rise was because of price promotion, sp yeah. 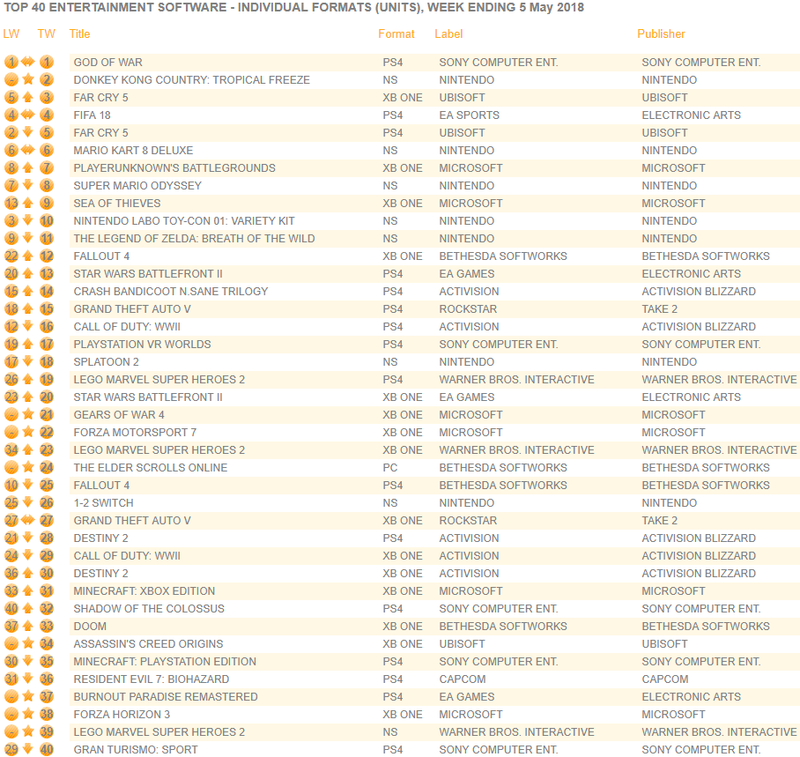 Inside top 20 of most played on UK and US, in Spain too but ES is a tiny market for Microsoft, I didn't ckecked other markets, The game is still the 4th best selling game on Amazon UK. The game is doing decent with or without bundle, let's not forget that is on game pass. It's like some people are rooting more for the multibillion company they love instead of rooting for themselves, it's incredible really. Wow April was the last possible month MK8D could have gotten the Sales Award for 500k sales considering game.de only gives them within one year after release. That was a close one lol. I wonder what was the last Nintendo title in Germany that has gotten the Special Sales Award. No idea about player count by yesterday the peak concurrent viewership peaked at around 2900. It's 15th on the Amazon yearly ranking, however Amazon shouldn't be used as barometer for games sales. SoTC is above God of War on it. It sold around 2k. I was trying to figure out the general performance, that doesn't look bad. Amazon is simply the easiest store to check the performance of any game. I don't have idea how is the bundle selling, but I wouldn't say that SoT have the hotest Xbox bundle, PUBG bundle is. Ah yes, I forgot it mentioned that too. Good to see GoW selling a lot. What an amazing game. Given how low effort the remaster was imo, it's probably very profitable for Nintendo. I would gladly buy a low effort SMT FE or Xenoblade X remaster though, so i'm part of the problem.